Bu çalışmanın amacı, sekizinci sınıf öğrencilerinin çoklu gösterimler (sözel, tablo, denklem ve grafik) arasındaki geçiş becerilerini ortaya koymaktır. Araştırmaya ilköğretim sekizinci sınıfta okuyan 4 öğrenci (3 kız, 1 erkek) katılmıştır. Nitel araştırma tekniklerinden örnek olay yönteminin kullanıldığı çalışmada veri toplama aracı olarak araştırmacılar tarafından hazırlanan “Çoklu Gösterimlerde Transfer Testi (ÇGTT)” ve yarı-yapılandırılmış mülakat kullanılmıştır. Veriler betimsel analiz tekniğiyle analiz edilmiştir. Bulgular, öğrencilerin en çok sözel, tablo ve denklem gösterim türlerinden grafiğe geçişte zorlandıklarını aksine sözel, denklem ve grafik gösterim türlerinden tabloya geçişte ise zorlanmadıklarını göstermektedir. Bunların yanı sıra öğrencilerin tablo, denklem ve grafik gösterim türlerini sözel olarak ifade ederken yaptıkları hataların yazma becerilerinin yetersiz olmasından kaynaklandığı söylenebilir. The aim of this study is to find out 8th grade students’ skills in translating among multiple representations (verbal, table, equation and graph). The research was carried out with 4 8th grade students (3 girls, 1 boy). Case study which is a qualitative research design was used for the study. Data were collected through “Translating Among Multiple Representations Test (TAMRT)” and semi-structured interviews which were developed by researchers. Descriptive analysis method was used to analyze the data. The results of the data indicated that the most difficult translations were from verbal, table and equation representations to graph. The translations from verbal, equation and graph representations to table were the easiest translations for students. Additionally, findings suggest that the students’ mistakes in translating table, equation and graph representations among verbal statements were stemming from lack of students’ writing skills. Ainsworth, S. E., Bibby, P. A., & Wood, D. J. (1997). Information technology and multiple representations: New opportunities – new problems. Journal of Information Technology for Teacher Education, 6(1), 93-105. Akkan, Y., Baki, A. ve Çakıroğlu, Ü. (2012). 5-8. sınıf öğrencilerinin aritmetikten cebire ge- çiş süreçlerinin problem çözme bağlamında incelenmesi. Hacettepe Üniversitesi Eğitim Fakültesi Dergisi, 43, 1-13. Akkuş, O. (2004). The effects of multiple representations-based instruction on seventh grade students’ algebra performance, attitude toward mathematics, and representation preferen- ce. Yayımlanmamış Doktora Tezi. Middle East Technical University, Ankara. Bağdat, O. (2013). İlköğretim 8. sınıf öğrencilerinin cebirsel düşünme becerilerinin solo takso- nomisi ile incelenmesi. Yüksek Lisans Tezi. Eskişehir Osmangazi Üniversitesi, Eskişehir. Çelik, D. (2007). Öğretmen adaylarının cebirsel düşünme becerilerinin analitik incelenmesi. Doktora Tezi. Karadeniz Teknik Üniversitesi, Trabzon. Çelik, D. ve Sağlam Arslan, A. (2012). The Analysis of Teacher Candidates’ Translating Skills in Multiple Representations. Elementary Education Online, 11(1), 239-250. Dede, Y. ve Argün, Z. (2003). Cebir öğrencilere niçin zor gelmektedir? Hacettepe Eğitim Fakültesi Dergisi, 24, 180-185. Demirci, N. ve Uyanık, F. (2009). Onuncu sınıf öğrencilerinin grafik anlama ve yorumlama- ları ile kinematik başarıları arasındaki ilişki. Necatibey Eğitim Fakültesi Elektronik Fen ve Matematik Eğitimi Dergisi, 3(2), 22-51. Driscoll, M. (1999). Fostering algebraic thinking. A guide for teachers grades 6–10. Portsmo- uth, NH: Heinemann. Ekiz, D. (2003). Eğitimde Araştırma Yöntem ve Metodlarına Giriş, Ankara: Anı Yayıncılık. Even, R. (1998). Factors Involved in Linking Representations of Functions. Journal of Mat- hematical Behavior, 17, 1, 105-121. Greenes, C. & Findell, C. (1998). Algebra Puzzles and Problems (Grade 7), Mountain View, CA: Creative Publications. Hadjidemetriou, C., & Williams, J.S. (2002). Children’s Graphical Conceptions. Research in Mathematics Education, 4,69-87. Herbert, K. ve Brown, R. (1997). Patterns as Tools for Algebraic Reasoning. Teaching Child- ren Mathematics, 3, 340-344. Hines, E. (2002). Developing the concept of linear function: One student’s experiences with dynamic physical models. Journal of Mathematical Behavior, 20, 337-361. Kaput, J. (1999).Teaching and learning a new algebra. Mathematics Classrooms that Promote Understanding,133–155. Kieran, C. (1992). The learning and teaching of school algebra. In D.A. Grouws (Eds.). Handbook of Research on Mathematics Teaching and Learning (pp. 390‐419). New York: Macmillan. Kieran, C. ve Chalouh, L. (1993). Prealgebra: the Transition from Arithmetic to Algebra, Edi- tör: Douglas T. Owens, In Research ideas for the Classroom: Middle Grades Mathematics, Reston, VA: NCTM. Kurt, G. (2006). Middle grade student’s skills in translating among representations of fracti- ons. Unpublished master’s thesis, Middle East Technical University, Ankara. Lacampagne, C. (1995).Conceptual framework for the algebra ınitiative of the national ınstu- tute on student achievement, curriculum and assesment. (Eds. Lacampagne, C., Blair,W. and Kaput, J.). The algebra initiativecolloquium, 2, 237-242. MEB (2009). İlköğretim Matematik Dersi 6-8. Sınıflar Öğretim Programı ve Kılavuzu. Ankara. Meij van der, Jan and Jong de, Ton (2006) Supporting students’ learning with multiple repre- sentations in a dynamic simulation-based learning environment. Learning and Instructi- on, 16 (3). pp. 199-212. Mooney, E. S. (2002). A framework for characterizing middle school students’ statistical thin- king. Mathematical Thinking and Learning, 4(1), 23–63. Moseley, B. ve Brenner, M. E. (1997). Using multiple representations for conceptual change in pre-algebra: A comparision of variable usage with graphic and text based problems. (ERIC Document Reproduction Service: ED413184). Mourad, N. M. (2005). Inductive reasoning in the algebra classroom. Published Master The- sis. (UMI No: 1431298). NCTM, 2000, Principles and Standards for School Mathematics, National Council of Teac- hers of Mathematics, Reston. Sert, Ö. (2007). Eighth grade students’ skills ın translating among different representations of algebraic concepts. Yüksek Lisans Tezi. Middle East Technical University, Ankara. Sezgin-Memnun, D. (2013). Ortaokul yedinci sınıf öğrencilerinin çizgi grafik okuma ve çiz- me becerilerinin incelenmesi. International Periodical For The Languages, Literature and History of Turkish or Turkic Volume 8/12 Fall 2013, p. 1153-1167, Ankara-Turkey. Sfard, A. (1995). The development of algebra: confront historical and psychological perspec- tives. Journal of Mathematical Behavior, 14, 15‐39. Stacey, K. ve MacGregor, M. (1997). Ideas about Symbolism That Students Bring to Algebra, Mathematics Teacher, 90, 110-113. Şahinkaya, N. ve Aladağ, E. (2013). Sınıf öğretmen adaylarının grafikler ile ilgili görüşleri. Adıyaman Üniversitesi Sosyal Bilimler Enstitüsü Dergisi, 15, 309-328. Vance, J. (1998). Number operations from on algebraic perspective. Teaching Children Mat- hemetics, 4, 282‐285. Walle de Van J., Karp, S.K.& Bay-Williams J. (2013). İlkokul ve Ortaokul Matematiği. Çev., Soner Durmuş. Ankara:Nobel Yayın Dağıtım. Wongyai, P. and Kamol, N. (2004) A Framework in Characterizing Lower Secondary School Students’ Algebraic Thinking, <http://www.icme-organisers.dk/tsg09/> (Erişim tarihi 15 Haziran 2012). Yerushalmy, M. and Schwartz, J. L. (1993). Seizing the opportunity to make algebra mathe- matically and pedagogically interesting(pp. 41-68)., Ed:T. A. Romberg, E. Fennema ve T. P. Carpenter, Integrating research on the graphical representation of functions Hillsdale, NJ: Lawrence Erlbaum Associates. Yıldırım, A. Ve Şimşek, H. (2005). Sosyal Bilimlerde Nitel Araştırma Yöntemleri. (2. Baskı). Ankara: Seçkin Yayıncılık. ISNAD GÜRBÜZ, Ramazan , ŞAHİN, Seda . "8. SINIF ÖĞRENCİLERİNİN ÇOKLU TEMSİLLER ARASINDAKİ GEÇİŞ BECERİLERİ". 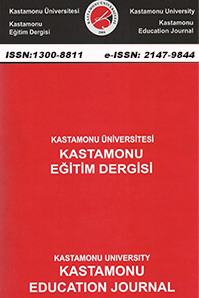 Kastamonu Eğitim Dergisi 23 / 4 (December 2015): 1869-1888.